Humphrey Maleka was born and raised in Soweto, Johannesburg. He started dancing at a young age learning Pantsula and other township dance forms and in 1991 was introduced to Afro-fusion and Contemporary dance styles. He met Alexandra le Maitre and began to study Flamenco and has attended seminars with Flamenco masters Domingo Ortega and Carmela Greco and has performed in several Flamenco productions with Lina Dolores Vega, Ritmo Spanish Dance Company and Camino Arts Project. In 2006 he was accepted into Ntsoana Training and Development Programme after which he became a member of the company. 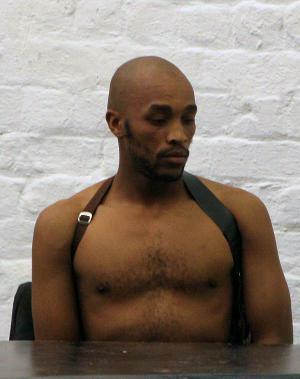 As a company member of Ntsoana he has performed in, and participated in, all of Ntsoana ‘s projects, performed at the Dance Umbrella, Arts Alive Festival, Jomba Contemporary Dance Experience, The National Arts Festival and has toured to Mozambique, the Netherlands, Germany, France, Turkey, Tunisia and the United States. Humphrey has participated in various choreographic workshops and in 2010 choreographed the solo work titled Naka tsa go rweswa which was performed at Goetheonmain and as part of the In House Project; his second solo, Displacement, was performed at Dance Umbrella in 2013. Humphrey is interested in socio-political matters these which affect people on a daily basis regardless of their race , culture, sexuality, class, religion, political affiliation etc. . His intention is to bring these matters to the fore so that they can stimulate conversations and discussions amongst people in the hope that they will come up with solutions to our societal challenges.